Other ferret cages come with tunnels, a fun addition for both owner and ferret. When purchasing ferret supplies like tunnels, always measure to gauge if your ferret is actually the right size for the tubes or you may waste money. Also, ensure that the tunnels are within the habitat and not circling outside of it: Industrious ferrets can break plastic tubes and escape. Another thing to consider is that cleaning of the tunnels can be a hassle you might not want to deal with. Reliable brands of ferret cages include Ferret Nation and Feisty Ferret. Ferret Nation cages tend to run on the pricey side, but are sturdy and reliable. They make ferret care a bit easier with accessories included. 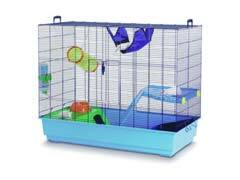 Feisty Ferret is more economical, and comes with many of the same features as the Ferret Nation cages. They do have drawbacks in that the floor of the second levels must be covered, and removal of the floors can only be done through the top of the cage. With proper searching and knowledge or your ferret’s needs, you can find the habitat that’s right for your pet, and your budget.